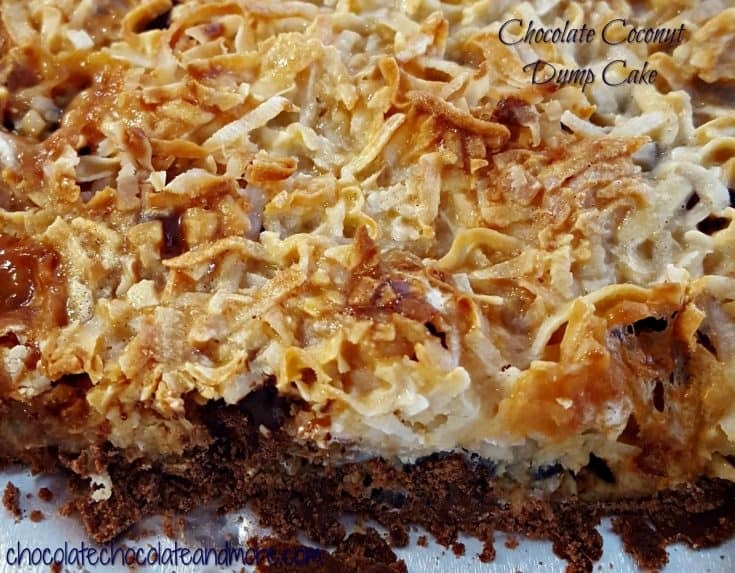 Chocolate Coconut Dump Cake - Chocolate Chocolate and More! Chocolate Coconut Dump Cake has rich chocolate, coconut flavor. It’s like Almond Joy in a pan. There really isn’t much easier than making a dump cake — grab a few ingredients and a pan, pile it all in, throw it in the oven and voila! Over the years, I have inherited a lot of cookbooks from a wide variety of sources: Junior Women’s Clubs, Hospital Volunteer Associations, other local community organizations. I discovered this recipe in a 16 year old compilation of recipes from my dad’s former co-workers at Pratt and Whitney Aircraft in West Palm Beach, FL. The premise of Dump Cakes is pretty simple — no need to mix ingredients — just layer in a pan like a lasagna and pop it in the oven. All the ingredients melt together as they bake, and voila, a sweet and gooey chocolaty treat that you can have for dessert, pack in a lunchbox, or just nibble on as you go through your day. 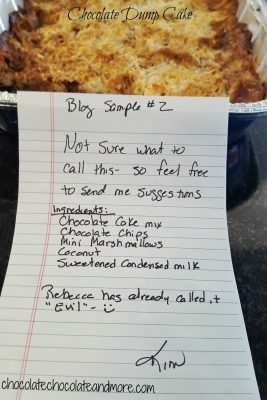 The original name for this recipe was “Miracle Bars”, but I was going to try and name this something a little more descriptive, so I brought the finished product into my office and placed a note with the pan asking for suggestions. The first one I got was “Evil, just plain evil – in a yummy way!”, but I figured that wasn’t a very good name for such a delicious treat. Another compared it to an “Almond Joy bar in a pan”, which is a very good description of what the end result tastes like. 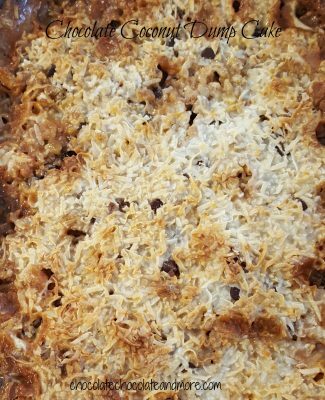 In the end, though, it is just a delicious dump cake, and Chocolate Coconut Dump Cake is as good a name as any for me. This recipe has six ingredients: butter, chocolate cake mix, chocolate chips, mini marshmallows, coconut, and sweetened condensed milk. The first time I tried to make it, the cake mix didn’t really get a lot of moisture to make it “cakey”, so I added a little bit of water between the mix and chocolate chips, and it worked out much better. I hope you enjoy it as much as we did! Starting with the cake mix, layer each ingredient on top of the butter. Or this Apple Raspberry Dump Cake from Six Sister’s stuff. I would like to know what size pan to use and how much water you sprinkled over the cake mix. Will be making this as soon as I get your answers! Would would you do with other half of the mix? Lana, that is up to you! I actually halved the cake mix recipe (it was a Duncan Hines) and just made a small cake out of the rest. You can also use it for cupcakes, or another reader commented she might just double the recipe and use the entire box! I would also like to know what pan size you used and the amount of water. It sounds like a recipe that could be easily doubled for a crowd. I used an 11″x17″ pan, but someone else mentioned using a smaller square pan, and it dawned on me that if you use a smaller pan, the same amount of butter would provide a thinker base and might actually provide enough moisture to solve the problem. (The original recipe in the P&W cookbook didn’t include a pan size, so I just went with my usual big pan, but next time I make it, I will try it with the smaller square pan and see if that fixes the problem!) If you try it, please let me know! So do you think if I used a 9 x 13 pan and doubled everything (including the sweetened condensed milk) that would work? This sounds yummy (& I may add some pecans in it too-everything is better with pecans!) I love your recipes! Keep them coming! I don’t see why not. And if you do double up on everything, I would say you wouldn’t need the addition water to sprinkle on the cake mix, as you would have plenty of liquid from the butter, chocolate chips and condensed milk. I would also like to know what pan size you used and the amount of water. It sounds like a recipe that could be easily doubled for a crowd.???? Is there a way to NOT use the condensed milk, to cut down on the sweetness?